Wednesday: Finding myself at work on my own, I received a phone call from my boss around 9.30am. �When you�ve finished screwing the floor down, you can pack the tools away and go. 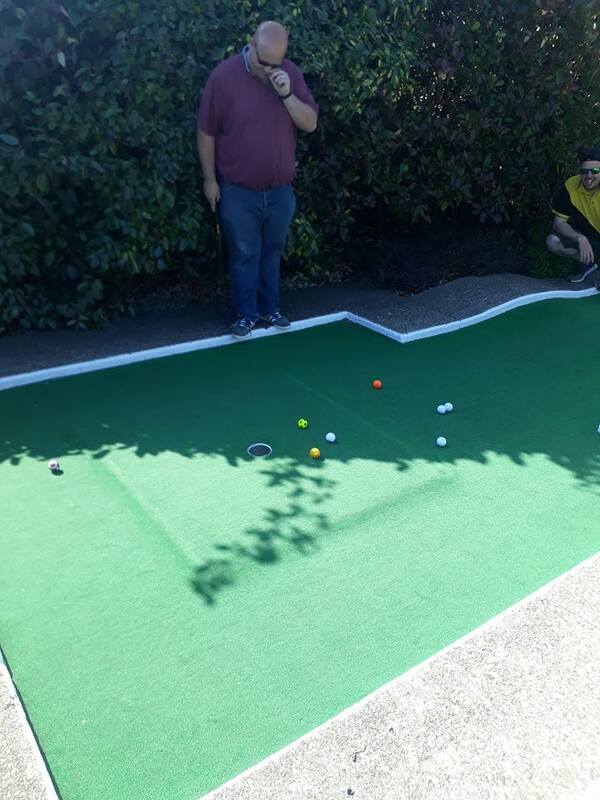 Have a good holiday.� And with that, I worked like a rabbit on heat and my World Crazy Golf Championship adventure was underway for the sixth time. By mid afternoon, I had reached Sussex and some time with dad as we caught up over some orange juice. Dad kept talking about the chip shop he now uses so I went and picked up dinner. Good chips. We went with the dog to the local pub and talked about life in general and in particular mum, who is still in hospital. I�m needing to talk to my parents more these days, with the distance between us placing an emphasis on what family really means. Thursday: My plan is to get to Hastings before everyone else goes to work but 6.40am is not early enough. Nothing frustrates me more than the car in front doing half the speed limit on a clear road with no chance of passing. Having learned some new swear words, I get to the course to see Martin practising and see what all the fuss is about on hole two, which has got a fluffy new coat. It will change the outlook of the most dangerous hole on the course for pretty much all who sail on her. Time is of the essence today as I will be heading to Guildford to see mum around lunchtime. Despite the tournament just being a one ball event so less to learn, it is crucial to get into a rhythm of judging the pace on the exposed felt. The metal rims here will severely punish you. Looking skywards and with clouds gathering, I turn to Martin and say that we probably haven�t got long before it chucks it down. From there, I picked up my ball, ordered a hot dog only for me to be proved right about the weather. That�s enough putting for me today. Just out of Hastings, the rain had disappeared until I got all the way to Guildford, where it must have known I was imminent. I caught sight of my mum in her ward and gave her a kiss. We talked a lot, we walked a little and as hard as it had been recently, being with mum is one of the few things that makes my truly happy. On the way back home, I start to really feel the effects of the day and get some sleep as I get in. We had initially agreed on having a salad to eat before dad forgot all about that and bought Chinese. We were both beat for the day so settled down with a beer watching the England match. I�m amongst the negative camp regarding our chances in Russia. Friday: Outside is perfect to go putting a ball or two. The majority of the field will show today but at what time. My Wasps team will all be at the course by 12.45pm, including Ed, who famously missed an interview with the BBC as his alarm didn�t go off last year. Whereas new lines were being learned on the second, the easiest hole (the 16th) was becoming far from it. Over time, as the ball drops off of the platform, the constant barrage it has received is akin to the speed at which Andy DuFresne got through the wall at Shawshank. Maybe one year, the landing spot will be covered by a poster of Raquel Welch. When you think you�ve got it, an unkind bounce makes you scratch your head again. That�s probably why I�m bald. 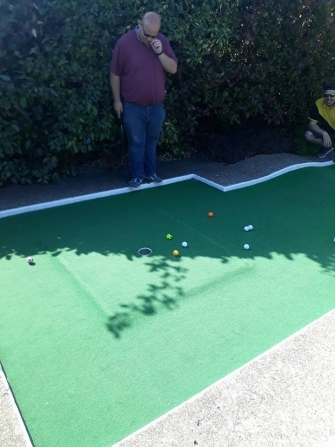 Around 3pm, I host the third running of my club event, where all balls are in play. This is the record field, with eight combatants, and with a trophy to the winner for the first time, provided by Dee and Martin. I really wanted this. The usual fun (if your idea of fun is trying to plot a path between four shots laid up short, then you�re in luck) ensued over the next ninety minutes. Nuno and Ed seemed to be pushing for the second title before I perform miracles recovering from three down on the 15th to go into a playoff with Ed. At the third extra hole and Ed jiffing as his life depended on it, I secured the coveted Wasps Crazy Crazy Crazy Crazy Crazy Crazy Crazy Crazy title. I will be coming home with something to mark my sporting prowess. We checked into the internment camp from last month and ate at the food court. I was pleased to see my fellow clubmates still out there, with Charlie and Derek playing until gone 9pm. I met with the guys from South Wales, who wanted to check out some pubs in the area. We left them to it around 10.30pm, thinking they would be done soon after. Four hours later, they were. Saturday: With an enormous field of 97 taking part, it was clear there would be a lot of free time today. After the morning warm up and the group photo, where I became Pikachu, I went shopping. With a drive to get more novices involved, 48 of them answered the call so every group would contain a debutant. For me, alongside Helen Dodd, would be Alan Turner. I get enthusiastic showing new players what the sport means to me to take part in, so I imparted my wisdom throughout the day. I need to keep the rounds clean to be competitive, as I have done the previous two years. Try as I might, I just can�t get my head into tournament mode and have what would turn out to be a series of loose shots throughout the day. A first round of 34, would set the tone for the weekend. Pick up a few, drop some. I just never got on a run. Thirty three groups in a round at four minutes a pop reduced to three minutes for the subsequent rounds. This was managing well until the man dressed as gorilla started �abusing� the time limit for a shot. I once counted 26 seconds from him just to spot a ball, which didn�t include lining it up and taking the shot. At one point, their group had fallen seven holes back and half the field spent the middle rounds sat down and waiting the move on. It caused some frustration amongst the following groups and hard to get focused. I talked to Alan to just check he was enjoying the day. In the meantime, we were entertained by the Welsh Open local champion suffering in the heat as the fumes poured out. Legend. The pros went first in round four, clearing the way for the novices to compete for their title. Every year, the standard increases and generally those that do well are the ones who listen and take it all in. With three of my club mates in with a chance, I go out to give them support. Dee had been exceptional and hopefully, this will give her the confidence she needs. Charlie had recovered from a terrible start to earn fourth spot after the most incredible playoff between himself against James Hollinrake that one of us should have really made an effort to record it. It ended at the seventh. Everyone took a deep breath after. I was keen not to spend all weekend in Wetherspoons this time, as I had done at the British Championships, so after a quick meal, we hit the Old Town for a scoop. Ed had performed exceptionally, setting a new club record of 28 in his first round and was right amongst the leaders. Derek and myself were on the cusp of the cut and Simon was happy to make it out for a second night in a row. Martyn was unavailable. With all the things going on in my life, I wanted to say I was happy to be here. Sad to say I wasn�t today. Sunday: I felt better after a night of reasonable rest and although the room is no bigger than a standard shed, the bed is comfortable at least. My aim is to get into the final round as I have done every year since 2014. My playing partners are Martin Greenhead and Ted McIver, who has taken part in every one since its inception in 2003. I need a good start and do exactly the opposite being three over after the sixth. I fight back to get to level par for the round by the end but I�ve blown my chance. Despite attempting to go for it in the last lap, I can�t do better than even and miss the cut. I just dropped far too many shots, which was uncharacteristic. It wasn�t my time, this time. Today has felt smoother, there is a good atmosphere and the return of the hole in one challenge is very welcome, raising money for a local charity. My desire to somehow be involved in any capacity leads me to having the honour of refereeing the final. Being close up to the three best players from the weekend is something I won�t forget. I just wanted the guys to feel relaxed and only be noticed when I needed to be. I have played in a few tense rounds, like the final lap of the English Open last year but this was an eyeopener. All three will look back at putts which they would normally make but overall, they handled the pressure well. When Marc rolled in the winning putt, his emotions spilled out. He was crying on my shoulder and I told him he was a worthy winner. Marc helped me when I needed help with anxiety so as much as I was pulling for all three to get over the line, as well as Nuno and Ed, I�m glad Marc won the tournament rather than someone losing it. By now, I had been on my feet all weekend and my legs were in pain. I picked up a joint award with Scott for the most aces. I hobbled back to the car to reflect on life once again. The traffic home wasn�t the delight I hoped for and nearly five hours after leaving Hastings, I got home to put the washing on and prepare for my next adventure in the Czech Republic this coming weekend.